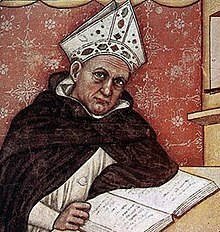 Albertus Magnus (before 1200 – 15 November 1280) was a German philosopher, theologian and Dominican friar who achieved fame for his comprehensive knowledge and advocacy for the peaceful coexistence of science and religion. He was the first medieval scholar to apply Aristotle's philosophy to Christian thought at the time. Twenty-Six Books on Animals [De animalibus libri XXVI]; cited in: Plinio Prioreschi (1996) A History of Medicine: Medieval Medicine. p. 94. The metals are all essentially identical; they differ only in form. Now, the form brings out accidental causes, which the experimenter must try to discover and remove, as far as possible. Accidental causes impede the regular union of sulphur and mercury; for every metal is a combination of sulphur and mercury. A diseased womb may give birth to a weakly, leprous child, although the seed was good; the same is true of the metals which are generated in the bowels of the earth, which is a womb for them; any cause whatever, or local trouble, may produce an imperfect metal. When pure sulphur comes in contact with pure mercury, after more or less time, and by the permanent action of nature, gold is produced. As quoted by Francis Preston Venable, A Short History of Chemistry (1894) p. 28. Albertus Magnus, in response to other of his students calling Thomas Aquinas a "dumb ox" because of his quietude. Of Albertus Magnus, the Doctor Universalis of the Dominicans, Roger Bacon writes that what is useful in his works might be summed up in a treatise twenty times as short as they are. Francis Seymour Stevenson, Robert Grosseteste: Bishop of Lincoln (1899) citing Bacon's Opus Tertium, p. 30 & Opus Minus, p. 327. Francis Seymour Stevenson, Robert Grosseteste: Bishop of Lincoln (1899) p. 50. "Albertus Magnus, Saint" by William A. Wallace (1970) in Gillispie, Charles. Dictionary of Scientific Biography 1. New York: Scribner & American Council of Learned Societies. pp. 99–103.